Were it just a family drama, 'God Country' would obviously take on a different narrative but the fact that Cates does the dementia-suffering elder Emmet Quinlan story justice is a testament to his versatility. You can't help but feel for his son having to choose between his wife and daughter or his destructive father. There is genuine tension and sadness in something that families deal with in real life. It's not a gimmick because it ties directly into what happens next, something unexpected and epic. Geoff Shaw's eye for sweeping shots of a rural setting with wide landscapes and weathered terrain shouldn't be ignored. His attention to detail is paramount to luring the eyes of the reader into the story. Naturally, Shaw flexes his muscles at the end with an eye-popping reveal that elevates the story in gigantic ways. Jason Wordie's colors are subtle and complementary but really let loose in the end as well. 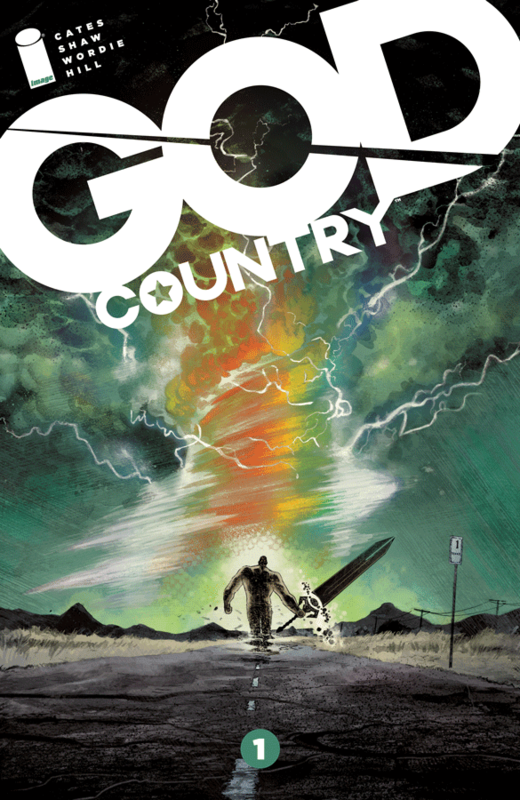 'God Country' arrives like a wrecking ball to your pull list. It demands to be read and once you read it you'll wonder why this title wasn't in your life sooner. Cates and Shaw lull you into a false sense of security before propelling your eyeballs out of your head. All hyperbole aside, this is how you make a first issue memorable and instantly addictive.